This post is written as response to Michal Zimmermann's article "Routing with pgRouting: Catchment Area Calculation". Michal's article was interesting to read, and it definitely contains some valid points of criticism. The drive-time polygons definitely don't look as one would expect! I couldn't believe, that this is pgRouting's fault, because the result always looked OK when using the drive-time and polygon generating functions. So hwo can it be done better? While drive-time (or catchment area) calculation is needed frequently, I must admit, that the related pgRouting functions are of inferior quality in the pgRouting Documentation, and they are not mentioned in the pgRouting Workshop at all. However, the use of pgr_drivingDistance or pgr_pointsAsPolygon follow the same pattern as most of the pgRouting functions. After learning through the workshop it shouldn't be too difficult to understand and use any other pgRouting function. This article shall be the first step to provide better documentation, eventually it will be added later as a new chapter for the workshop. And as the third step we use osm2pgrouting to parse and process the OSM and import it into our database. mapconfig.xml needs to be adjusted depending on the purpose. However in this post I'm using the default settings. The latest version of osm2pgrouting supports incremental data processing, so if your data size exceeds the required work memory, you can split the area into many and process them one by one. osm2pgrouting will make sure, that only missing network data will be added. There is nothing else to do! The data is ready for pgRouting! 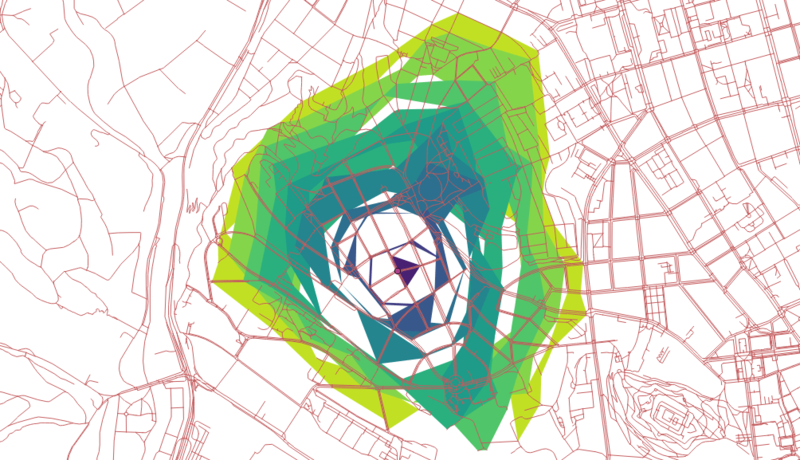 With pgr_drivingDistance we can calculate the distance (cost) from a start node to any other node in the network until a maximum cost is reached. Because our network data is rather small, the maximum cost of 3600 seconds starting from node 15632 covers the whole area. And for simplicity we store the query result in a table distances. Note: the cost parameter in pgRouting can be computed as you like. osm2pgrouting already pre-computes some costs based on distance and on time, using the settings from the mapconfig.xml file. The function [pgr_pointsAsPolygon](9) draws an alpha shape around a given set of points. The polygon is computed using CGAL's 2-D Alpha Shape algorithm and by default uses an optimal alpha value. It's crucial to prepare the network data correctly! For the examples standard costs (seconds) were used, that do not fit for pedestrians and need some custom calibration. Queries can be written more elegant, for example as stored procedures to accept variables as function arguments.